With their diminutive size and simple shape, votive candles look spectacular in a variety of different styles of holders. If you're looking for an easy and affordable way to update the look of a room, there are many unique styles of votive holders to choose from. There are plenty of cheap votive holders that fulfill a basic purpose, but if you're looking for statement-making options, you still have lots of choices. From wall displays to centerpieces, novelty votive cups and more, there's a style out there that will be perfect for your decor. The addition of glass, stone, or acrylic jewels adds a bright, luminous beauty to any votive holder. You can find jeweled holders in a number of different configurations and colors, all of which will bring a luxurious glow to any room in your house. Gold Jeweled Beaded Indian Indian Holder- Give your home or patio some exotic flair with this votive holder. 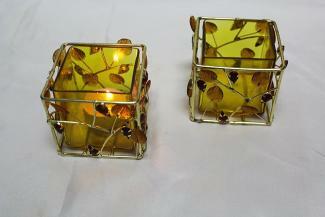 It has a transparent, gold-colored inner holder that sits in a wire outer holder that has beautiful leaves and jewels. One of these holders retails around $10. Turtle Metal and Crystal Votive Candleholder- Available from Bed, Bath and Beyond, this jeweled turtle votive holder is bound to become a conversation piece. If you're looking for something a bit unusual, this holder runs about $14. Turquoise Glass Mosaic Candle Holder - This elegant holder from Hobby Lobby features turquoise glass "jewels" against black ceramic. Grouping several of these affordable holders together would create a gorgeous display that would look lovely any time of the year. Each votive cup retails around $12. 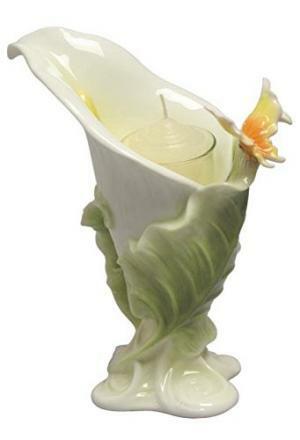 Votive candles look gorgeous in unique floral holders, whether they imitate a single blossom or an entire branch. This type of candle holder is a great way to bring the beauty of nature into your home; floral votives look pretty in the bedroom, living room, and any other area where you want to add a little nature-inspired style. Lotus Votive Holder - Manufactured by Summit, this striking resin lotus holds a single votive. The beautiful details set this holder apart from other lotus styles, and it would look lovely on a nightstand or as a pair on a mantle. This holder retails for about $12. Romantic Rose Votive Centerpiece - This 12.5-inch-tall votive holder from Gifts & Decor resembles a single long-stemmed red rose with a graceful stem and iron leaves. It would look beautiful on its own or even more dramatic displayed in a group. Each votive holder is crafted from iron, acrylic, and glass and retails for about $17. White Calla Lily Votive Holder - This porcelain votive holder sold at Amazon makes a dramatic statement, but it also looks stunning any time of the year. It stands 7-inches high and retails around $53. If you're really looking for something unique, a novelty votive holder makes the ultimate statement. You can choose from humorous designs or spectacular figural pieces that display your favorite animals and interests in addition to the votives. 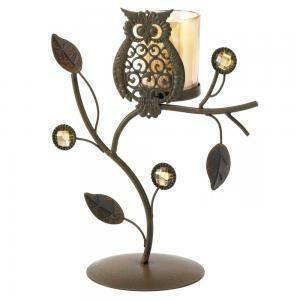 Wise Owl Ornamental Votive Holder - Sold by Amazon.com, this unusual votive holder features a metal owl, vines and leaves, and pretty glass jewels. It stands almost nine inches tall and would look great in a pair on your table. This holder retails for just over $13. Glass Cat Votive Holder by Lenox - This adorable votive features a black cat in a Halloween scene. Just under five inches tall, this small holder can work almost anywhere you need a little Halloween-themed charm. It retails for about $25. Himalayan Rock Salt Votive Candle Holder - If you're on the lookout for votive holders to display on your patio, this set is a perfect choice. 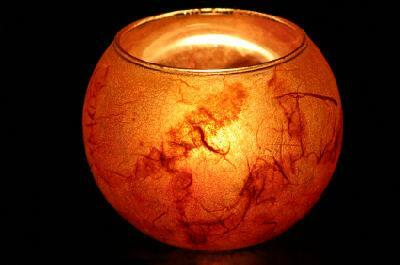 They're made from Himalayan rock salt and give off a lovely orange glow when your candles are lit. The set retails for about $23 from Amazon. A metallic accent can sometimes be the perfect way to add romance and sparkle to your home. There are plenty of lovely gold and silver votive candle holders on the market, and many offer the unique style that will make them a focal point wherever you choose to display them. Silver Mercury Glass Votive Candle Holder Set - These six cup-shaped gold mercury glass holders from LSD offer an affordable, elegant option. They feature a subtle, lacy design and have, a warm all-over silver glow. Perfect for the holidays, the patio, or any other setting, each holder is three inches tall, and the set retails under $40. Branch Votive Holder - If you're looking to make a larger statement, this large centerpiece from ZGallerie is a bold and beautiful choice. At 28.5 inches long and 17.5 inches wide, it would look spectacular on a dining room table. 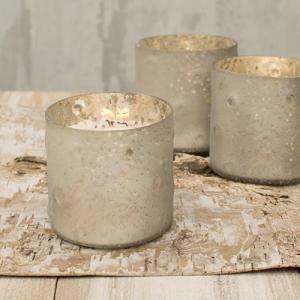 The chunky gold branches support four votive cups. This option retails for $130. Antiqued Silver Votive Holder - This votive cup sold at Houzz gleams in shiny silver. It is embossed with a fleur-de-lis design. Several of these would look great placed around the patio or as a grouping on a bookshelf or mantle. Each holder retails for about $4. No matter what your religion, there are votive holders designed to celebrate and honor your faith. Many of these offer unique style and beautiful designs. 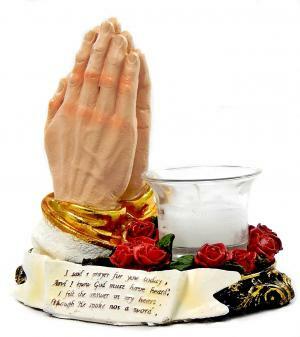 Praying Hands Votive Candle Holder - This polyresin votive holder from Amazon.com features praying hands and roses. It is about six inches tall and supports one votive candle. This holder retails for about $20. Four-Sided Glass Buddha Votive Holder - This cube-shaped clear glass votive holder from Buddha Groove features an image of Buddha on each side. It holds a single votive and measure three inches high. This holder retails for $34. Displaying votives on the wall in the form of sconces or larger focal points is another unique way to decorate your home with candles. Wall displays come in all kinds of shapes and sizes, many of which may be perfect for you. Circles Wall-Mount Votive Holder - This huge wall display from Pottery Barn features seven interlocking iron circles, each with a votive. It measures 64 inches long and would make a great modern focal point in any home. It retails for $120. Tea Light Hearts and Birds Candle Holder - Offered by Walmart, this metal display features birds, branches, and leaves. It is crafted of metal and supports five glass votive cups. It would look great in a foyer or dining room. This option retails just under $55. Wrought Iron Acorn Votive Sconce - Offered by Stacey's Simple Stuff, these beautiful sconces hold three votives and have an oak leaf and acorn design. They measure 15.5 inches high and would look beautiful flanking a piece of art or a mirror. They retail for close to $33 each. A votive chandelier adds romance and beauty to your dining room, bathroom, or patio. They also look gorgeous in gazebos or hanging from pergolas. Since they require no electrical connection, they are very easy to install anywhere you want a little ambience. 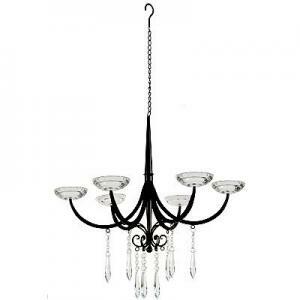 15-Candle Two-Tier Votive Chandelier - Sold by Mirrors and Magnifiers, this graceful votive chandelier is crafted from wrought iron and supports 15 glass votive cups. It has a lovely scroll design and hangs from sturdy chains. This model retails for about $45. Large Metal Lead Crystal Candle Chandelier - Featuring beautiful lead crystal droplets to reflect the candlelight, this chandelier from Amazon.com would look great in a bedroom. It supports six votive candles in glass cups and hangs from a sturdy chain and hook. It retails for about $120. Mini Chandelier Hanging Votive Candle Stand - This interesting design sold by Amazon features two votive cups that hang in their own metal stand. You can place it on the dining table, patio table, or any other surface for a beautiful centerpiece - no need to hang a hook on the ceiling. It retails for less than $20. There's no reason to settle for the mundane when it comes to votive holders. With all the gorgeous and unusual designs on the market, you're sure to find something that will really complement your room and your decor. Take your time browsing through the options to ensure you find a votive holder that has the unique look you need.